Many aspects of geomorphology indicate that the Green River Formation (GRF) was deposited during the Flood. The massive deposition and erosion of the GRF immediately suggests the Flood catastrophe and not post-Flood processes. Pediments and the long-distance spread of well-rounded quartzites also points to the Flood. Furthermore there are many climatic problems if the GRF and associated formations were post-Flood. Based on multiple criteria, it is believed that the Flood/post-Flood boundary is in the ‘late Cenozoic’ over the western United States. I will briefly address several of John’s comments in his second presentation,1 in the general order presented. Figure 36. Block diagrams showing the development of pediments along the sides of mountains during the downvalley drainage of floodwaters (drawn by Peter Klevberg). * Figures are numbered continuously through all the articles in this forum. The shift from continental Mesozoic sedimen­tation to more local and regional Cenozoic sedimen­tation is what one would expect during the Flood. While in contrast, we do not expect to see widespread sheet erosion and rapid basin filling in a post-Flood world. Whitmore makes the case that the basins filled rapidly but more time than a year is required. Indeed, processes that at first glance seem to require more than a year are a significant challenge to a Flood model. However, similar time challenges are present throughout all the sedimentary rocks. The amount of post-Flood catastrophism required for all the activity suggested in the GRF basins is immense. The filling of these huge basins with thousands of metres of sediment seems orders of magnitude too large for post-Flood processes. The huge erosion of these basin fills also seems to be orders of magnitude too large for post-Flood processes. Furthermore, the deposition of present-day river sediments is commonly in river flood plains as well as in the ocean. We should see copious amounts of downstream valley sedimentation from the GRF, if the erosion was post-Flood. There are numerous climatic anomalies if the GRF were post-Flood. There is a monstrous amount of volcanism represented in the GRF and the overlying Bridger Formation that would have cooled the land by reflecting sunlight back to space from ash and aerosols in the stratosphere. If there were snow in the surrounding mountains, winters in such valleys would be cold. Secular researchers have assumed that the warm Eocene climate, deduced mostly from fossils, is real, and they have been fudging their models to find the warming. One variable in the climate simulations that results in warmth during the Eocene is a constantly warm sea surface temperature.2 Such warm temperatures keep the air warm, whereas if sea surface temperature were a variable in the models, the ocean temperature would likely cool resulting in a cooler atmosphere. As far as delaying the post-Flood Ice Age, I cannot see how this could happen, because the ocean water was the warmest (most rapid evaporation) and the stratosphere likely would have the highest amount of ash and aerosols from the Flood (causing much cooler summers over mid and high latitude continents). If the Ice Age was delayed, say 200 years, the oceans would have significantly cooled and the post-Flood volcanism would likely have waned to the point it would have been difficult to start the Ice Age. Pediments seem like obvious effects of strong currents moving off the land during the Recessive Stage of the Flood (figure 36*).3 Uniformitarian scientists have failed to explain the origin of pediments, and it seems impossible for post-Flood catastrophic processes to produce such unique, worldwide geomorphological features in the post-Flood period. Regarding the particular pediments on the GRF, I suggest they formed during the transition from enclosed basins to the current through-flow drainage. I believe pediments are an indication that the sediments they sit on are from the Flood. Interpretations of these sediments cannot be used to infer a post-Flood origin of pediments. The quartzites in southern Wyoming are very likely from south-east Idaho and the Uinta Mountains. However, the quartzites in the northern Green River Basin likely are from central Idaho.4 Some of these quartzites are on top of GRF sediments indicating the GRF sediments are from the Flood. I believe geomorphology provides a much better and more direct indication of the Flood/post-Flood boundary than sedimentology. The latter is too equivocal and uniformitarian interpretations dominate the literature. From geomorphology, it appears that practically all the Cenozoic sediments all over the world, except possibly the ocean basins, are from the Flood. But we must examine every area on its own merits. That is why I believe the overwhelming evidence from the GRF and associated formations, as listed in my first submission6 indicates that the GRF was deposited in the Flood. Because of tracks and nests found in the GRF, I believe that much of the GRF and associated sedimentary and igneous rocks were likely deposited in the late Inundatory Stage of the Flood.7 The erosion of the area, including the spreading of quartzite, the formation of pediments and the cutting of water gaps took place in the Recessional Stage. Whitmore, J.H., The geologic setting of the Green River Formation, Journal of Creation 20(1):72–78, 2006.Return to text. Sewall, J.O. and Sloan, L.C., Less ice, less tilt, less chill: the influence of a seasonally ice-free Arctic Ocean and reduced obliquity on early Paleogene climate, Geology 32:477–480, 2004.Return to text. Oard, M.J., Pediments formed by the Flood: evidence for the Flood/post-Flood boundary in the Late Cenozoic, Journal of Creation 18(2):15–27, 2004. Return to text. Oard, M.J., Hergenrather, J. and Klevberg, P., Flood transported quartzites—east of the Rock Mountains, Journal of Creation 19(3):76–90, 2005. Additional papers in this series are in press. Return to text. Oard, M.J., Vertical tectonics and the drainage of Floodwater: a model for the Middle and Late Diluvian period—Part II, CRSQ 38(2):89–93, 2001.Return to text. 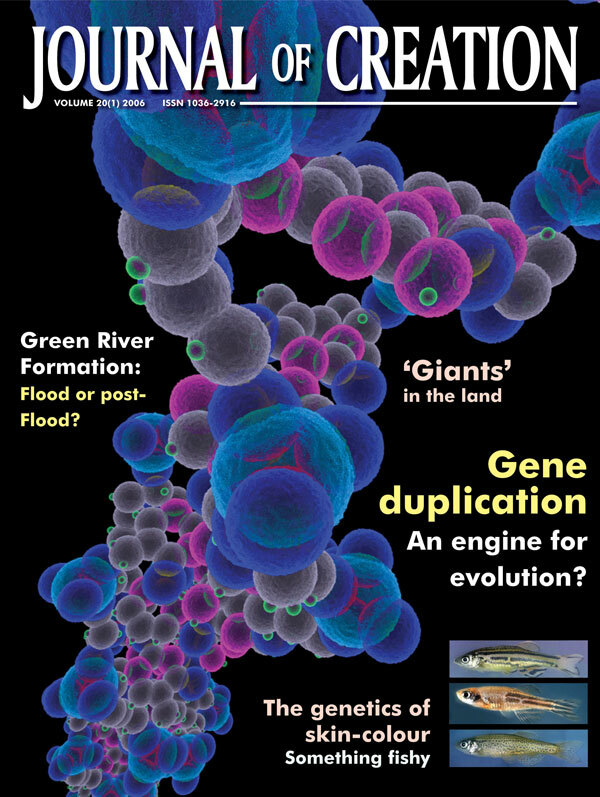 Oard, M.J., The case for Flood deposition of the Green River Formation, Journal of Creation 20(1):50–54, 2006.Return to text. 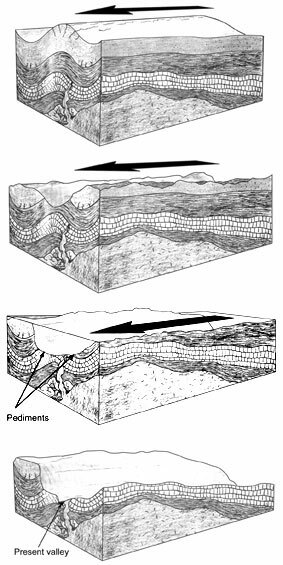 Walker, T., A biblical geological model; in: Walsh, R.E. (Ed. ), Proceedings 3rd International Conference on Creationism, Creation Science Fellowship, Pittsburgh, pp. 581–592, 1994. Return to text.